Find used sails that fit your boat from multiple vendors, explained in terms that relate to your boat. Just enter the brand of your boat, pick the specific boat from the list, and the type of sail you are interested in. The next page will list sails that might fit the boat you have selected. Calculations are made, such as %LP and percent of maximum as appropriate so you can see easily which sails might be of interest. The sails listed here are from these US vendors: Bacon, North, Pineapple, and Minneys. I will add vendors as I get a personal recommendation and know they are reliable. You can click on the sail you are interested in and I will email you the contact information. I do not have a mailing list and do not save your email address. I make no money on this service, it is just a service for the boating community. 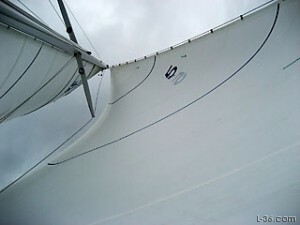 Enter the sail type you are interested in as well as your boat brand in the form at the top of this page. If your boat is not listed, try entering just part of the name. For example, enter CAL instead of California. If your boat is still not listed, click on 'BOAT' and enter your dimensions on the next page. This is a 93 % jib. The clew is about 0 feet above the tack. The information in these data bases is a starting point. There are errors as you can see as the different data bases do not always agree. In addition, some boats have been modified from stock and will not match the data in these databases. None of this data has been checked by L-36.com so please always check your boat before ordering any sail.